Some people take Christmas way too seriously. You know the ones I’m talking about. Those single, no kids types that make their place look like Santa’s workshop inside and out. They’re the ones who put on the Christmas sweaters and start listening to carols in November and they always leave milk and cookies out for old Saint Nick and maybe even a carrot or two for the reindeer. Yeah, you can smell the eggnog and gingerbread on their breath from here, can’t you? But what if I told you that we’re all supposed to be that way, that our lack of Christmas cheer was being caused by an evil, parasitic snake-larva living in our guts? Get ready because tonight we’re going to save the Humbug. While I was at the Women in Horror Film Festival this past September, I saw a lot of phenomenal films written, directed, produced, and filmed by women with a very unique take on the horror genre. There were films represented in every length and varying sub-genre during this weekend of fun and mayhem but one in particular stands out me as the holiday season steamrolls over us. 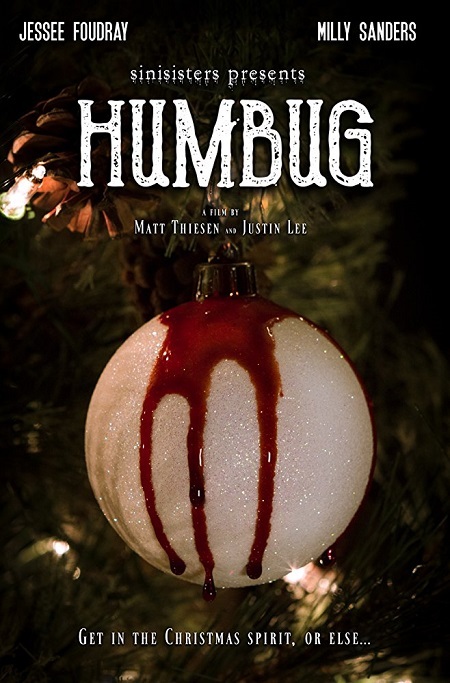 Humbug is a tale of two neighbors; Scarlet, a dark, horror obsessed goth chick who hates the holidays and Betty whose saccharin, seasonally affected personality is a holiday horror show all on its own. When Scarlet refuses to make with the Christmas cheer, Betty decides that she is inhabited by the Humbug, a malevolent evil that warps otherwise jolly folks into Yuletide hating Scrooges. The film runs like a straight-out kidnapping, torture horror until the very end and is guaranteed to bring some joy and laughter into your night. Written by and starring Milly Sanders as Betty, the story is inventive, witty, and outright hilarious. One of several horror shorts from SiniSisters Productions (Sanders and Humbug co-star Jessee Foudray) the film’s a must-watch for your holiday horror list. Meanwhile, the Humbug itself is a wonderful bit of practical effects engineering that looks so disgusting yet simplistic at the same time that you can’t help but fall in love with it and the idea that it represents. A maleficent parasite bent on killing Christmas one person at a time. The writing, direction, cinematography, and performances are all incredible. Brevity is the soul of wit and, as a writer, I can say it’s hard to tell a proper story in a short amount of space. Whether your medium is prose or film, a short word count or a short run time adds an extra challenge in developing characters and plot. At just over six minutes, Humbug is not going to be a huge investment of time for viewers, but the payout is well worth it when it comes to development and story. Think of Humbug as that extra dash of cinnamon on your Christmas cookies. It’s going to make the holidays a little jollier for every horror fan on Santa’s list. And as a special treat, here’s the film, or you can watch it for free Youtube. Be sure to like and subscribe to SiniSisters Productions and check out their other films available online.